Rhininol - oil is most used as a steam bath in horses. 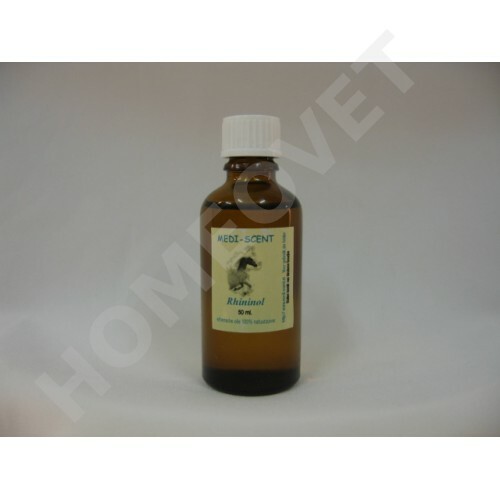 Homeovet Rhininol - Oil is sold worldwide under various private labels by HomeoVet. Rhininol is a product of HomeoVet Animal Care Holland. Rhininol is a particularly strong product based on natural essential oils and can be used without problems in combination with other remedies. As steam - oil 2 times a day ; give 10 drops in a bucket, then infuse hot water and inhale (careful not to burn nose). You can also use Rhininol yourself with a cold or flu. It acts quickly and directly. Simply give 5 drops in a bowl of hot water and inhale.